Health is not a scientific phenomenon. It is biosocial, a complex interaction between the body and social forces that shape our lives. As a doctor working in Palestine, I’m faced with a toxic set of social, economic, and political realities that result in the ongoing sickness and death of patients, friends, and colleagues. 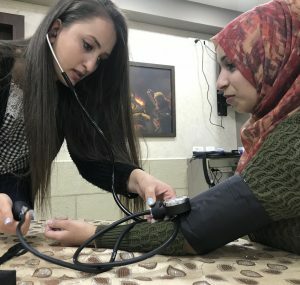 In response, a community-driven health movement is emerging, made up of Palestinians who have been living in refugee settlements for five generations now. Together we seek to improve health care delivery for the chronic diseases that result from the geopolitical chess game that traps Palestinians in warlike conditions and subjects them to ongoing settler colonialism. Political violence in Palestine has once again crossed the threshold of international attention. May 15, 2018 was Nakba Day, referring to the 1948 Palestinian catastrophe (nakba) in which 90% of Palestinians fled their homes, were forced to flee, or were massacred. Roughly 25,000 refugees from 1948 are still alive, and a few are our patients. The majority of Palestinians are in the diaspora, far from their homes. It is the second largest refugee crisis in the world, having recently been surpassed by another tragedy, Syria. The patients we work with in refugee camps are from 27 villages inside what is now the state of Israel, including the city of Be’er Sheva where I attended medical school. Last month, during protests against the US’s decision to move our embassy from Tel Aviv to Jerusalem, there were incursions from the Israeli army in the camps where we work: tear gas, clashes between heavily armed soldiers and boys with stones, but thankfully no loss of life. Our community health workers, who have the dubious distinction of belonging to the most tear gas-exposed community in the world, continue to see patients. Two days before the embassy move, they saved a man’s life after finding him in a diabetic coma. On May 14 while Jared Kushner and Ivanka Trump celebrated the opening of the new US embassy in Jerusalem, 61 people in Gaza were simultaneously being killed, including eight children, with over 2700 injured—a mere 40 miles from the embassy ceremony. The New York Times tweeted that “dozens of Palestinians have died in protests,” a choice of language rightfully derided by those paying attention. “Shame on you,” film director Judd Apatow tweeted, “This is like calling Trump’s lies ‘factual inaccuracies.’ Please tell me an intern is running your twitter feed.” But the Gaza protest is not really about the US embassy move, which, while symbolically important and devastating for many Palestinians, is also an open and honest admission of the US’s real—and longstanding—commitment to “peace” in Israel/Palestine. No, this protest wasn’t really about the embassy, or even about the services Palestinians in Gaza lack—clean water, shelter, health care, electricity—all the basic things required for a dignified life. It’s more selfless and beautiful than that. The Gaza Palestinians started their protests on Land Day (March 30) in solidarity with Palestinian citizens of Israel, who make up 20% of the Israeli population. Land Day commemorates Palestinian protests in the Galilee in 1976 after Israel declared they would be taking their lands for state use. This land was confiscated from Palestinian citizens, bringing to mind Malcolm X’s teaching point, echoed by James Baldwin: “If you haven’t got the rights of a citizen, then you’re not a citizen.” But while the nature of their citizenship is debatable—they’re also subject to over 65 racist laws, a number that was less than 50 when I first moved to the region in 2010—Palestinian citizens of Israel enjoy much higher standards of living and security than the nearby stateless Palestinians in Gaza, over two-thirds of whom are refugees. Which is why I describe this six-week protest, the Great March of Return, as selfless and beautiful even in the face of tragedy. The protest is fundamentally about the right of all Palestinians to equality and the right to return to their lands, a right recognized in nearly every legal and ethical system humans have developed. Speaking volumes about their courage as well as the deep desperation of their living conditions, these protestors faced bullets and tear gas daily for six weeks in order to assert this basic right. More than 100 people killed and over 10,000 injured—people like Hussein Madi, who was shot dead three days before his 14th birthday. Meanwhile, Israeli physicians contend in a leading medical journal that Palestinians in Gaza shoulder the blame for these killings as well as their ongoing health crisis, a remarkable example of ahistorical victim-blaming. The oft-repeated falsehood that Hamas orchestrated this mass protest also makes an appearance, an assertion as condescending and dehumanizing as it is bewildering, as if Palestinians in Gaza have insufficient reason or ability to organize spontaneously against one of the more cruel and unusual collective punishments in the world. While we tend to automatically justify our own violent American revolution—which, let’s remind ourselves, was about taxation and political representation—we’ve often hypocritically held different standards for those who protest or revolt against deeper historical injustices (e.g. the Haitian Revolution), or who refuse to accept dispossession, displacement, mass incarceration, and other conditions no human beings should be asked to tolerate. Such double standards flood the Western conversation on Palestine, leading to the constant parsing of non-violent vs. violent resistance at the expense of a rigorous conceptual framework that explicates violence through its origin, maintenance, and current power structure. Brazilian educator and philosopher Paulo Freire contends that “never in history has violence been initiated by the oppressed…It is not the helpless, subject to terror, who initiate terror, but the violent, who with their power create the concrete situation which begets the ‘rejects of life.’” When your humanity is denied, when you’re propagandized as a terrorist, when your motives are twisted from just demands into accusations of blood-thirstiness, then a massacre predicated on an extreme power differential can become an American headline where some “have died” while protesting. This power and the accompanying right to expose other people to death, with minimal consequences or censure, is what postcolonial theorist Achilles Mbembe has named necropolitics. Health care providers, dedicated to preserving health and life, have a responsibility to counteract necropolitics, to protest and resist all its forms. Palestinians, like our dedicated community health workers, engage in this form of resistance on a daily basis. Our task is to find ways to support their efforts by challenging the social and political forces, many sanctioned by our own deeply complicit US government, that make their work so difficult and necessary. Bram Wispelwey is Chief Resident in Global Health Equity at Brigham and Women’s Hospital/Harvard Medical School and Chief Strategist and Co-founder of Health for Palestine, a novel community organizing initiative in Palestinian refugee camps. A collaboration between the Lajee Center in Aida Camp and 1for3 in Boston, Health for Palestine seeks to maximize wellness and address health barriers via social accompaniment and creative integration with existing facilities. Bram holds degrees in biology, nutrition, medicine, and public health from Princeton, Columbia, Ben-Gurion, and Harvard. During medical school and residency, he engaged in global health work in Palestine, Burundi, Rwanda, Madagascar, and Ethiopia, with research and writing on racial triage disparities, ethics, social and political barriers to health, and structural violence. Before the start of his medical career, he pursued LGBT-rights activism, which has irrevocably informed his health approach at the bedside and in advocacy. His principal interests include social medicine, liberation politics, and radical approaches to racial and socioeconomic health inequities.